Life is too short to NOT to cheer and celebrate our loved one. Give your friends your love and support in the best manner possible. Let them know you support them and what they are going through. Social Media has been the main source of communication for over 10 years now. I fortunately was a part of Facebook back in 2004-5 when it was just college students. Yet, we still spoke to each other. We still met up and not played on our phones. We still encouraged each other. Today, people use social media to cheer on friends and family members. Emojis and GIFs are used to encourage people. It's just plain impersonal, Folks! Let’s get away from the lazy way to express what we truly free. Speak to someone. Encouragement means so much more when they can hear you or see you. Life is too short not to be someone’s cheerleader. I have friends battling life difficulties. I applaud their energy and strength with trips to grab coffee, homemade desserts and being with them at their events. 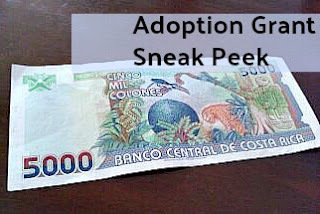 Before I get started, I wanted to state that rather you are for or against adoption grants, know that this is merely tips to help you prepare for that road. Funds related to adoption is super controversial, but at the end of the day, they do exist. Before jumping in with both feet, check out what they require and YOU decide rather it's the right road for you.Thinking of applying for grants to fund your adoption? Here are a couple tips that you will need to think about before you get started. Lay out your household finances. If you have yet to figure how much money you and your partner bring home and how much it costs to run a household, now is the time to do it. Almost every grant wants a peek into your personal finances. One grant wanted to know how much we spent on food, gas, rent and car notes. It gets personal folks so be prepared.